The Walking Dead fans who read Robert Kirkman's comics have an upper hand on what to expect from the AMC TV series. Occassionally, the team at AMC will change things up and play with fan expectations for well known moments from the comics but, sometimes, they adapt them word for word. Throughout Season 7, especially, The Walking Dead has stayed true to its source material like never before. Much of Negan's dialogue is pulled straight from his original remarks in the books. Unfortunately, that has meant the end for a few fan favorite characters along the way. 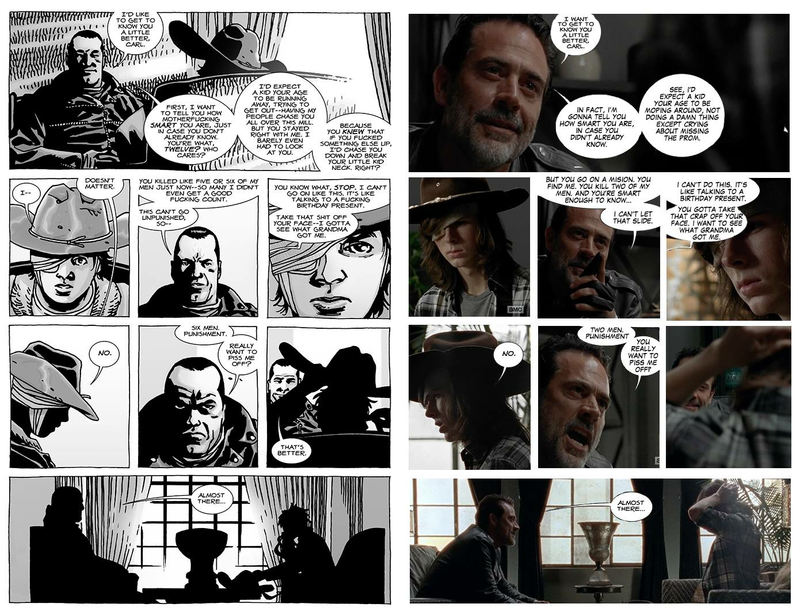 On the following slides, we explore five times The Walking Dead masterfully followed its comic book source material. Season 5 of The Walking Dead saw one of the most infamous deaths from its comics realized on television. While the character had to be switched because Dale died in The Walking Dead's second season, the manner in which Bob was eaten alive by the people of Terminus was pulled straight from Kirkman's original writing. Comic book Dale and TV show Bob both shared a laugh and the line, "Tainted meat!" as their enemies chowed down on their well cooked leg. 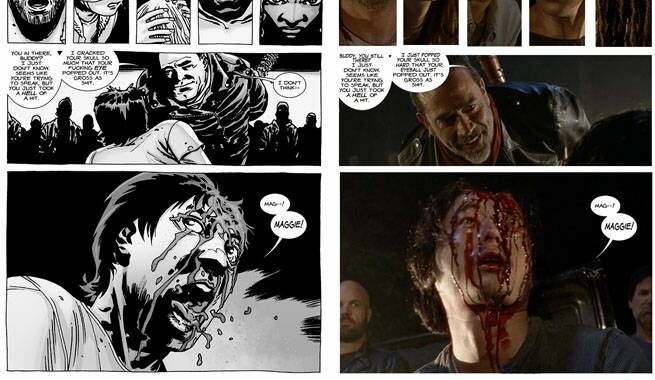 Twice, The Walking Dead has accurately adapted moments involving Carl's eye. First was his actually shot in the face. In the comics, Carl getting shot in the eye was a mistake. As Reg Monroe was swarmed by a zombies during the No Way Out storyline, he went down firing his gun in every direction. One of those bullets struck Carl's eye leaving him standing, bleeding, and asking for his "dad?" Later, Carl's interaction with Negan was perfectly adapted to television. After gunning down some of Negan's men from the bed of one of their trucks, the little Grimes boy was forced to remove his eye patch and sing a song to the villainous leader of the Saviors. The moment was perfectly adapted to television in the Sing Me A Song episode half way through Season 7. The Alexandria Safe-Zone, as a whole, is a master class in adapting settings from comic books to live action. The crew behind AMC's The Walking Dead brought Charlie Adlard's work in the comic books to live action life neaar perfectly. The walls are accurate to the comics. The houses are accurate to the comics. It's as if the little Senoia, Georgia neighborhood was built with one purpose: be the Alexandria Safe-Zone. The Hilltop, a set entirely created for the AMC series, is also a spot on portrayal of Gregory's community. Spencer's death the midseason 7 finale was ripped straight from his guts -- errr, the comics. 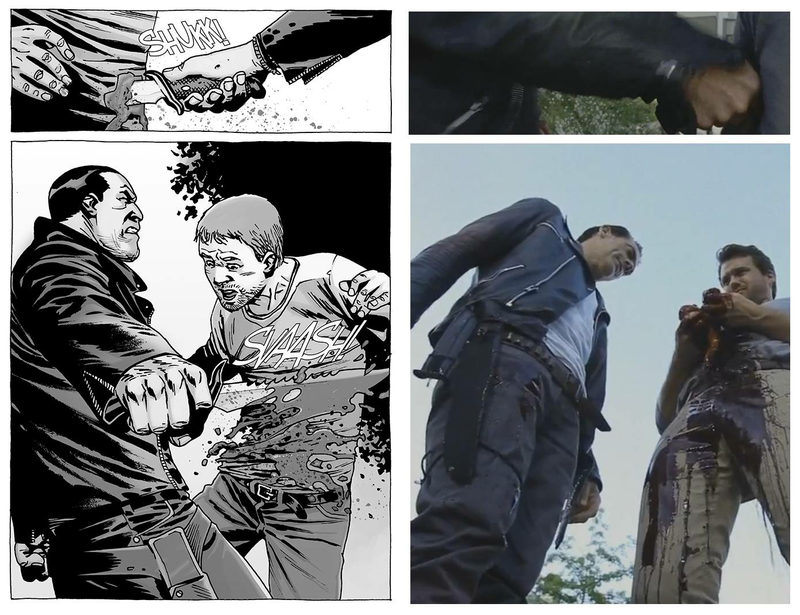 When Spencer approached Negan about taking down Rick Grimes and putting himself in charge of the Alexandria Safe-Zone, Negan reacted exactly as he did in the comics for television. He questioned Spencer's motives, he questioned Spencer's guts, and he drove a knife into Spencer's stomach to reveal them. Spencer died, holding his guts leaking from his stomach, in front of Alexandria. 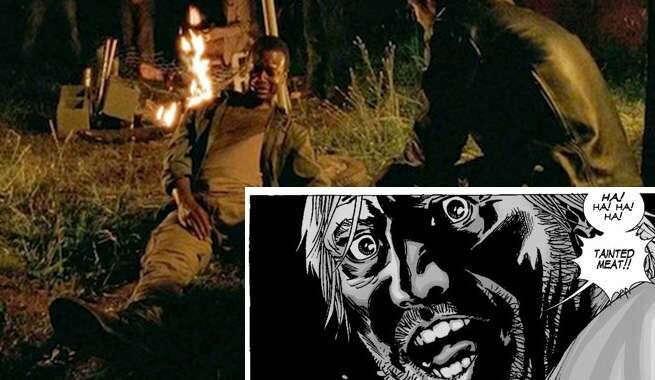 The most notorious moment from The Walking Dead comics was realized in the highly anticipated Season 7 premiere on October 23. Killing Abraham was a slight course correction for the TV series to accurately follow the source material but the bashing of Glenn's skull, Negan's harsh torment of the now-brain damaged survivor, and the call out for Maggie were all moments pulled straight from the comics. It was a moment which put The Walking Dead in the spotlight following an epic cliffhanger in the Season 6 finale, months prior to unveiling the victims identities.